Augustine’s Italian Village was started in 1957. The original site was 1909 E. Washington Street in New Castle (across from Cascade Park). The owners were Sara, Frank, Helen, and Joe Augustine. Augustine’s Italian Village moved to our current address, 833 E. Lutton Street in 1960. Over the years, Augustine’s Pizza watched three of the four of the original owners pass away, while Sara Augustine kept running the business. Sara Augustine worked all the way into her 80s, doing bookwork in the 2000s with no computers. Sara recently has been relieved of her duties, although she still to this day continues to go in on Saturdays to check up on the place. Sara had two sons, Frank and Joe, who both loved the family business. Both were actively involved in running the business, until Joe Augustine tragically died of a heart attack in 1996. Frank R Augustine, Sara Augustine, and Sara’s nephew Mike Linz continued to run the business. Over the years, Augustine’s Pizza grew and grew under their management. It went from a sit down and take-out restaurant, to a frozen pizza distributor. Augustine’s Frozen Pizzas could now be found in stores of all sorts, whether it was Economy Markets, Giant Eagles or small convenient stores… If you checked a frozen food area, one of our pizzas will be there. 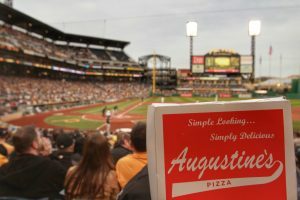 Augustine’s Pizza took a major step in 2011 by introducing their product to be sold in PNC Park and Heinz Field. Frank J. Augustine, who is Frank R. Augustine’s son, graduated from college and joined his father and Mike in running the business. The three of them made this monumental step for us possible. Augustine’s Pizza became a sponsor of both the Pittsburgh Steelers and the Pittsburgh Pirates for 3 seasons. This exposure more than tripled the amount of grocery stores Augustine’s Pizza’s could be found in. Today, Augustine’s Pizza is still a proud sponsor of the Pittsburgh Pirates. 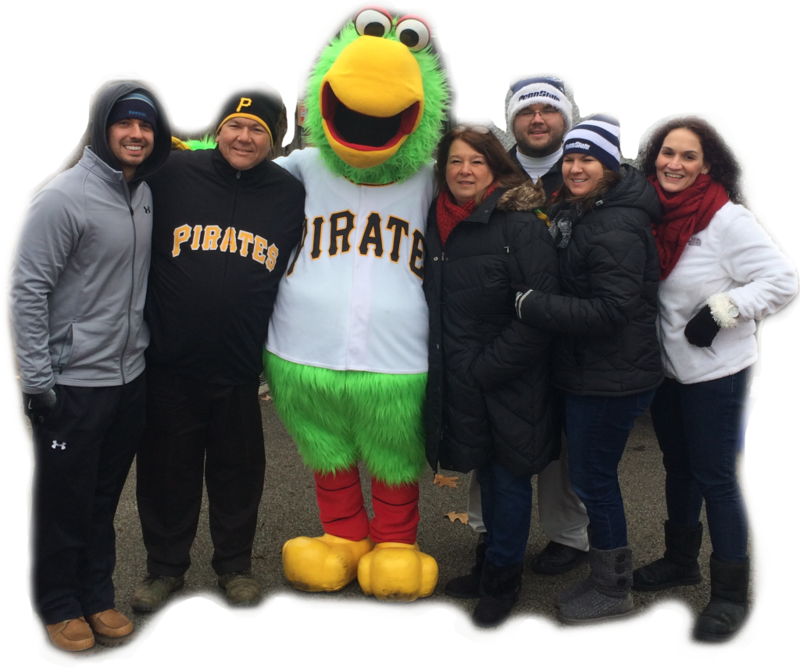 Selling their families pizza and seeing their families name in PNC Park is an absolute dream for both Frank R. and Frank J. Augustine. Being avid Pittsburgh Pirates fans their entire life, it never gets old going to the stadium and seeing it. Augustine’s Pizza also started a fundraising opportunity by selling our Pizzas. Helping great causes and organizations raise money selling pizza has been avery successful and positive experience for everyone involved. The business has stayed very family oriented over the years. More than 15 Augustine’s employees are directly related to the Augustine family. Ashley Rhodes, a teacher at Neshannock Elementary School, but still stays actively involved doing the bookwork. Frank R’s wife and Frank J’s mom, Kim Stroia Augustine, also does the bookwork for the business. Just like the business, Frank R. and Kim had their first grandson born on September 25, 2013, as their daughter Ashley gave birth to their beautiful baby Luke. Before we know it, he’ll be at the plant making pizzas just like the rest of us.